Valbray watch company released new limited edition model – Devil Inside (Ref. VR01 L), which is stylistically based on the provocative theme of the devil. A model of a round body made of titanium with a black DLC coating. Water Resistant – 50 meters. Double dial with the shutter mechanism, the diaphragm, like the camera, consisting of 16 petals, protects sapphire with double anti-reflective coating. The dial is opened and closed manually by turning the bezel. On the lower dial shows the black flame, represented a golden color, and red-hot lava in red. Chronograph counters, date display, and three overhead red devil figures complement the design dial. Three counters are located on a black background dial, located inside the number “6” and form a “666” which is the number of the beast. The Bible mentions this number as the embodiment of numerological henchman of Satan. When rotating bezel aperture closes, turning the clock in a stylish accessory with three arrows, of which made the hour and minute in black tones, and second – in the red. New Devil Inside is equipped with an automatic 25 stones, with a frequency of 28,800 vibrations per hour and 44-hour power reserve. 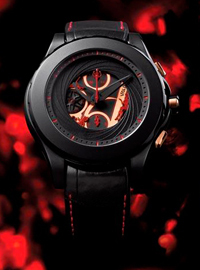 The model comes on a black alligator strap with red stitching. Issue of new items limited to 6 numbered copies, available only in Switzerland. 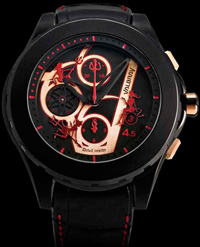 Buy watches from Devil Inside Valbray possible for 24,666 Swiss francs.